Jennifer Doudna is Professor of the Departments of Chemistry and of Molecular and Cell Biology at University of California, Berkeley and an Investigator of the Howard Hughes Medical Institute. Early in her career, she studied the structure and mechanism of ribozymes (enzymatic RNA molecules) and RNA-protein complexes. Now her research focuses on understanding how RNA molecules control gene expression in bacteria and eukaryotic cells, through CRISPR-Cas9 and RNA-mediated mechanisms, respectively. For her outstanding scientific contributions, she was elected into the American Academy of Arts and Sciences in 2002 and the National Academy of Sciences in 2003, and was awarded the 2015 Breakthrough Prize in the Life Sciences. 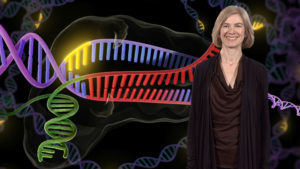 Learn more about Jennifer Doudna's research here.